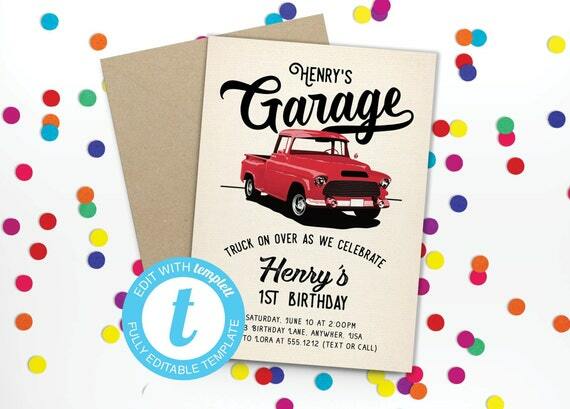 Create the perfect party with this vintage truck editable Invitation, and save precious time and money by printing the files yourself or by emailing or texting the invite as an evite! Copy and paste this link into your browser to access our FREE demo. The Templett application works best on a desktop browser. Tablets and mobile browsers are currently not supported. SOME AREAS of the invitation are not editable and are considered part of the design. Our invitation templates are editable using Templett. Simply follow the instructions below after purchasing. Instructions are included as an instant download. 2. Follow the link in this email to access your editable template. 3. Continue Saving your template as you make changes. You'll be able to save your invitation as a PDF or JPG for printing, as well as PNG for sharing via email, text, or social media. Buyer is welcome to print invitation as many times as they like. NO COMMERCIAL USE ALLOWED. File is for personal use only - any file sharing or reselling of the file or artwork contained in the file is strictly prohibited.